New members are very welcome. We have more club projects than our current membership can handle, so our club numbers have to grow to meet these needs. If you are keen to volunteer in a project of your choice and want to have some fun, this is likely to be the club for you. Although we all have the same passion for volunteering, every Rotary club is different. If you would like to become a Rotarian, you might like to visit several clubs before deciding which is the one that is right for you. 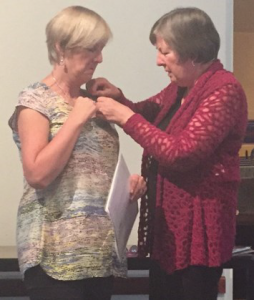 Attend a simple induction ceremony with our Club President and your Club Mentor. What are the commitments ? Our Rotary Club meets weekly for dinner on a Monday evening. Many members choose to attend every week and only notify us when they are unable to attend. However, we are a flexible club. We have several members who can’t make it every week, so they only notify us when they can attend. This allows us to order the correct number of meals from our caterer each week. We have many volunteering opportunities. Some members choose to lead specific club projects, others volunteer regularly on a particular project and others are there to jump in when we are short of help for a specific activity. It’s really up to you how involved you wish to become. We advertise volunteer opportunities during weekly club meetings and in our weekly club newsletter that is emailed to all members. 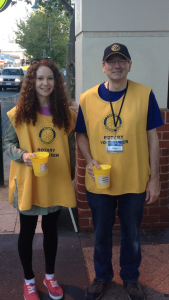 The majority of our charitable funds for Rotary projects comes from three club members volunteering each week, to collect donations at the Camberwell Sunday market. This makes our club around $1,000 each week. There is an expectation that members, who are physically able, participate in a market roster three or four times each year. As many of our club projects involve children, we ask members to maintain a Victorian Working With Children Check. There is no cost for volunteers to register. We try to keep costs to members to a minimum. We don’t want our club to exclude anyone due to costs. A sponsorship is offered to those in their final years of University, or while they are still job hunting, to enable them to join our club when funds are short. These younger members are wonderful volunteers with many great ideas. Our club does not charge a joining fee. Each year our club has to pay around $240 per member to Rotary International and to our Rotary District for membership fees and insurance. We ask new members to pay a pro-rata membership fee on joining, to cover these fees for the remainder of the current financial year. Our annual club membership fee is around $350. This can also be paid quarterly. These funds are used to pay our membership fees to Rotary and to administer our club. We never use funds raised for charitable purposes for club administration. Weekly dinner cost is $30, to cover the cost of the meal and venue hire. Some members eat at home, in which case there is no cost to participate in the meeting, if you don’t need the meal. At weekly meetings we often run a game or competition, where members contribute small change to participate. These funds are used for club administration, unless a particular cause is nominated at that specific meeting. We often use this money to hire entertainment for our special annual dinner at the end of June. We spend over $70,000.00 a year on various projects. But none of this is raised from members. Most of these funds come from our members volunteering to collect donations 3-4 times a year at the Camberwell Sunday Market. Unless you wish to join our Fund Raising committee, members in this club dedicate their time to spending the funds on club projects, rather than raising them. How do I attend a club meeting ? Simply submit this form as a prospective member before 10am on the day of the meeting. Then come along at 6:15pm. There is no charge for the first meeting for a prospective member. Blaise is a writer, publisher and writing mentor. To signify turning fifty, she went on a little adventure by walking across Spain on the Camino de Santiago carrying everything that she needed for six weeks. Blaise walked over 800 kilometres and went through a gamut of physical, emotional and spiritual transitions. She also met a lot of people from all over the world doing the same thing. They were all pilgrims looking for something. Some didn’t know what they were looking for, but that question was often answered for them by the time they finished. Blaise certainly didn’t know she was looking for anything, but she sure did get a lot of answers.